Dr. Teller also works with the Biomolecular Structure and Design Program. In the past several years the research endeavor of this group has shifted from a major emphasis on the hydrodynamic and thermodynamic properties of proteins and other macromolecules to studies of proteins by x-ray crystallographic methods. We have continued interest in the evolution of protein structure and function, however. At the current time we are continuing our crystallographic studies of human coagulation factor XIII, an important blood coagulation protein, by the methods of x-ray diffraction. 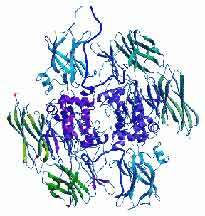 Activated factor XIII is the prototypical enzyme of a family of transglutaminases and related proteins found universally among animals. These large proteins are intimately involved in formation of skin and hair, in blood coagulation, in fertilization events, and in several disease states as well. Factor XIII is activated to factor XIIIa by thrombin in the final step of the coagulation cascade. Factor XIIIa is a transglutaminase serving to cross-link fibrin to form a stable clot. Additionally, factor XIIIa performs other cross-linking functions which promote wound healing. The zymogen, factor XIII, has been used in the published crystallization studies to date. The human zymogen is synthesized by the yeast, Saccharomyces cerevesiae. The molecule is a dimer of molecule mass 166 kDa with 730 residues per monomer. Current efforts are directed to the study of site specific mutant forms of the protein, to crystallization studies of the thrombin activated enzyme, and to study of inhibited forms of the enzyme and zymogen activated by high calcium ion concentrations. In addition to the investigations of factor XIII, we are attempting crystallization of several other coagulation factors and inhibitors of those factors. “Structural determinants of the bifunctional corn Hageman factor inhibitor: x-ray crystal structure at 1.95 A resolution.”, Behnke, C.A., Yee, V.C., Le Trong, I., Pedersen, L.C., Stenkamp, R.E., Kim, S.S., Reeck, G.R., Teller, D.C., Biochemistry 37(44):15277-15288 (1998). “Identification of the calcium binding site and a novel ytterbium site in blood coagulation factor XIII by x-ray crystallography”, Fox, B.A., Yee, V.C., Pedersen, L.C., Le Trong, I., Bishop, P.D., Stenkamp, R.E., Teller, D.C., J. Biol. Chem. 274:4917-4923 (1999). “Structure and function of Factor XIII”, Chapter 15 in “Hemostasis and thrombosis : basic principles and clinical practice”, Loewy, A.G., McDonagh, J., Mikkola,H., Teller,D.C., Yee, V.C. Colman,R.W., Salzman, E.S., Hirsh,J., Marder,V.J. eds, Lippincott-Raven Pub. 4th ed. in press (1999). “Crystal structure of rhodopsin: A G protein-coupled receptor”, Palczewski K., Kumasaka T., Hori T., Behnke C.A., Motoshima H., Fox B.A., Le Trong I., Teller D.C., Okada T., Stenkamp R.E., Yamamoto M., Miyano M., Science 289:739-745 (2000). “Crystal structure of a 30kDa carboxyl terminal fragment from the gamma chain of human fibrinogen”, Yee,V.C., Pratt,K.P., Cote,H.C.F., Le Trong,I., Chung,D.W., Davie,E.W., Stenkamp,R.E., & Teller,D.C., Structure, 5(1), 125 (1997). “The crosslinking kinetics of the human blood transglutaminase factor XIIIA acting on fibrin gels and gamma-chain peptides”, Lewis,K.B., Teller,D.C. Fry,J., Lasser,G.W. & Bishop,P.D. Biochemistry, 36(5), 995 (1997). “Structure and function studies of factor XIIIA by X-ray crystallography”, Yee,V.C., Le Trong,I., Bishop,P.D., Pedersen,L.C., Stenkamp,R.E. & Teller,D.C., Sem. Thromb. Hemostat., 22, 377 (1996). “Domain structure, stability, and domain-domain interactions in recombinant factor XIII”, Kurochkin,I.V., Procyk,R., Bishop,P.D., Yee,V.C., Teller,D.C., Ingham,K.C., & Medved,L.V., J. Mol. Biol., 248, 414 (1995). “Structural evidence that the activation peptide is not released upon thrombin cleavage of factor XIII”, Yee,V.C., Pedersen,L.C., Bishop,P.D., Stenkamp,R.E., & Teller,D.C., Thromb. Res., 78, 389 (1995). “The Corn Inhibitor of Factor XIIa. Crystallization and Preliminary Crystallographic Analysis”,Pedersen, L.C., Yee, V.C., von Dassow, G., Hazeghazam, M., Reeck, G.R., Stenkamp, R.E., & Teller, D.C., J. Mol. Biol.236, 385 (1994). “Three-dimensional structure of a transglutaminase: Human blood coagulation factor XIII”,Yee,V.C., Pedersen,L.C., Le Trong,I., Bishop,P.D., Stenkamp,R.E., & Teller,D.C., Proc. Nat. Acad. Sci., 91, 7296 (1994). “Transglutaminase factor XIII uses proteinase-like catalytic triad to crosslink macromolecules”, Pedersen, L.C., Yee,V.C., Bishop,P.D., Le Trong,I., Teller,D.C., & Stenkamp,R.E., Protein Science, 3, 1131 (1994). “Expression, Purification and Characterization of Human Factor XIII in Saccharomyces cerevesiae”,Bishop, P.D., Teller, D.C., Smith, R.A., Lasser,G., Gilbert,T., and Seale,R.L.Biochemistry, 29,1861 (1990). “Human Recombinant Factor XIII from Saccharomyces cerevesiae: Crystallization and Preliminary X-ray Data” Bishop, P.D., Teller, D.C., Le Trong, I., Stenkamp, R.E., and Teller, D.C. J. Biol. Chem., 265, 3888 (1990).